We sent Emily of Sassy in Sequins on a trip to our favorite pop up, FoMu. We thought it was a pretty sweet outing! Open Newbury is your last chance to catch FoMu Ice Cream on Newbury Street! Not sure what to wear to Open Newbury? Check out Mackenzie’s summer look from Jack Wills. As a Back Bay resident for the better part of a decade, Newbury Street has been a constant in my life. Nestled between the Charles River and busy Boylston Street, it’s small in size yet big in influence. 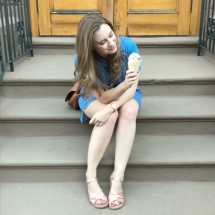 I visit Newbury Street a few times a week, so when Newbury Collection reached out to introduce me to the newest pop up shop on the block, FoMu Ice Cream, I jumped at the opportunity. 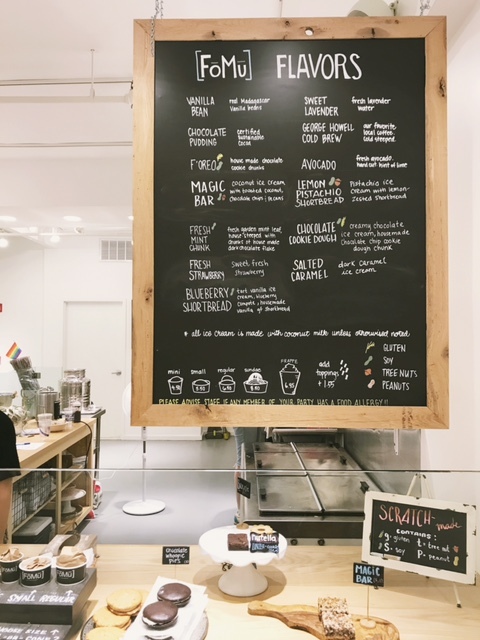 FoMu scoops up small batch ice cream made with plant based ingredients at 177 Newbury Street. The Newbury location is FoMu’s third store in Boston and a refreshing oasis among beautiful brownstones. Walking down the stairs, it’s clear upon entering that this is an ice cream store like no other. FoMu’s bright and airy aesthetic is matched by their unique vegan flavors. Plants and seating line the crisp white walls, providing ample space to consider the array of frozen treats displayed on a large chalkboard and fresh bakery items. Flavor options range from the basic to complex and there’s something for everyone—Vanilla Bean and Fresh Strawberry for the purists, and Sweet Lavender, Blueberry Shortbread, and Avocado for gustatory adventurers. Local to Boston, FoMu also offers flavors like George Howell Cold Brew, created in collaboration with other local businesses. All of the flavors are made with coconut milk, replacing the standard cow’s milk found in most conventional ice creams. This is good news for customers like me who avoid dairy due to personal or dietary restrictions. In addition to removing dairy ingredients, many of the flavors are also nut and gluten free. 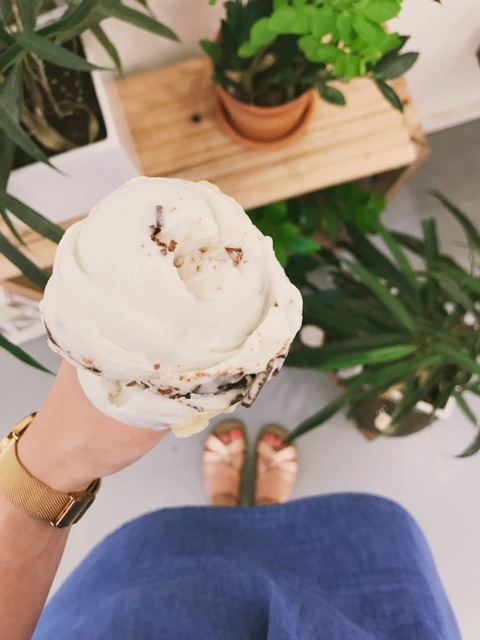 On the day I visited, FoMu was offering Fresh Mint Chunk ice cream made with fresh garden mint leaf, house steeped with chunks of house made dark chocolate flakes. Mint and chocolate is my favorite flavor pairing and after sampling same of the other delicious offerings, I ordered a small waffle cone of my go-to treat. 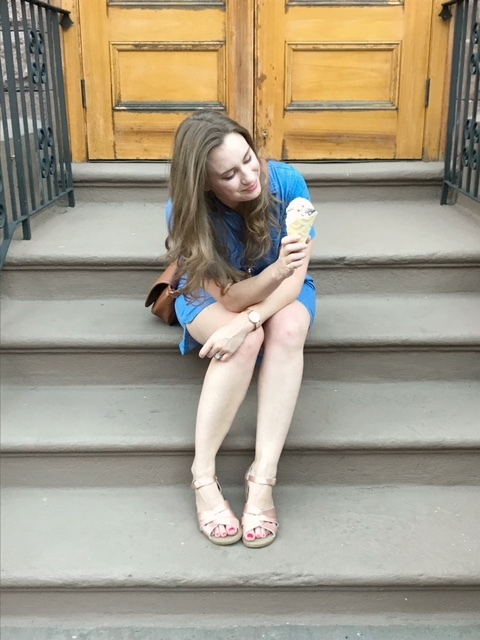 Refreshing and full of taste, my cone of FoMu ice cream was the perfect treat on a warm summer day. Stop by FoMu on your next jaunt down Newbury Street and grab yourself a cup or cone of FoMu’s alternative ice cream. You won’t be disappointed! Looking for an excuse to take that jaunt down Newbury Street? Come to Open Newbury on Sunday, September 10th. Newbury Street will be pedestrian-only on these three days, allowing for a car free experience for the entire nine block stretch of shops and restaurants!